· To clean the mirror I use vinegar and water. · To clean the tub, I found that a 40/60 solution of vinegar to hot tap water in the bottom of the tub works well. You let the vinegar/water solution soak for about 15 minutes and then scrub with a brush and drain. Rinse with hot water and done. If you don't like the vinegar smell, don't worry it will go away after you rinse the tub. Happy safe and natural cleaning. 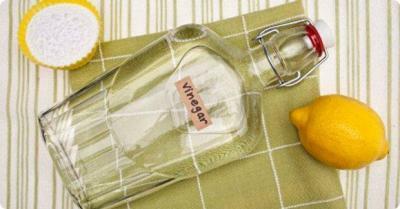 · Put some vinegar in a baggy and use a rubber band to hold it on to the shower head to clean away buildup. · To keep your plastic shower curtain free of mildew, keep a spray bottle filled with white vinegar and water by the tub. At the end of your shower, spray the shower curtain, especially along the lower edge. You'll be amazed by the difference! · The cheapest way to mop your kitchen floor is to mix vinegar with water. Buy the large containers and it makes some cheap disinfecting mop water. The vinegar smell will go away when the floor dries. · Here's how to clean your kitchen cabinets and any woodwork in an inexpensive, green way. Mix equal parts of white vinegar with hot water (you can use less white vinegar if your cabinets are not real dirty, smudged up, greasy prints, etc.) add a few drops of olive oil and use a soft rag to clean. The white vinegar cuts grease and grime effectively and safely and also disinfects. The olive oil leaves a nice shine behind. I also use this mixture to mop my hardwood floors - it leaves them beautiful. It is so easy to use and so very inexpensive. · We use a spray bottle with plain white vinegar as a kitchen cleaning spray. It's cheap and green. But my favorite part is that it's safe enough for my young daughters to use. So, for less money, I can help train my daughters and get some needed help in the kitchen. · I use vinegar for everything in the kitchen. It is so easy to use. I clean my stove with it, it cuts the grease very well and I use it to clean my counters and my floors. I double mop my floors but the vinegar first helps cut the grease on the floors from regular cooking troubles. · Use vinegar on the bathroom floor to get rid of the urine smell if you have small children or your husbands friends are messy or for a cat litter box kept in the bathroom. · For extreme hard water problems while washing dishes in the dishwasher add 1 cup of distilled vinegar to the rinse cycle. Simply open the door and poor it in. Not only does it correct old spots, but in prevents new ones. It also helps keep the mechanics of the dishwasher free of deposits. · Tired of wasting money on a special or fancy solution to clean out your coffee pot? Simply use vinegar! Mix part vinegar with part water and run it through like you would if you were actually making coffee (be sure to keep the carafe underneath!). The vinegar combined with the heat will leave your coffee pot like new (and your coffee will taste better too!). P.S. This is also a trick I use when I want to use my coffee pot to make hot water (it removes all the coffee taste that would otherwise be there). · The simplest way to soften your clothes naturally is to add 1/4-1/2 cup of distilled white vinegar to the rinse cycle. I bought a softener ball and use it strictly for this purpose. · Add just about 1/4 cup of white vinegar to sheets and towels, shower curtains and other household linens to prevent that mildew smell. · White vinegar will also whiten your white clothes and it is not as damaging as chlorine bleach. You can use it in every load, not just once a month! · For a quick wipe down of the bathroom counter I use a box of baby wipes (any brand) and add some rubbing alcohol to the box. I store the box in the bathroom and when the sink needs a quick wipe down, pull a baby wipe and wipe everything down. · To get faucets to look sparkling new, I wipe them with a cotton ball soaked in rubbing alcohol. It doesn't damage them and is super cheap. · We attach a sprayer to a new bottle of rubbing alcohol and keep in handy for quick light spray of the shower after every use! It cuts down on germs and makes it for easier to clean. · Getting back the shine on my granite counter tops seemed impossible until I discovered this tip. After wiping off the grease or crumbs with a dishcloth, I use a mixture of 50% rubbing alcohol/50% tap water to bring back the shine! I just keep a bottle mixed under the sink and use it every time I clean. · For hard water stains on your shower door and chrome use lemon oil. It will make it look brand new. · You can clean anything sticky off any surface with a drop of lemon essential oil and a cotton ball or by rubbing lemon rind (where the essential oil comes from) on the surface. · Tired of using harsh cleaners to scrub our pots and pans, I went back to a natural solution: I cut a lemon in half, spray the pan with water, sprinkle it with salt, and then scrub with the lemon. It cleans remarkably well, smells great, and is not dangerous. · I have two bathrooms with very large mirrors. I keep a spray bottle of plain water and an automotive style sponge/squeegee combo like you use for car windshields in my bathroom under the sink. I can spray the mirror with plain water, wipe it down with the scrubby sponge side, then squeegee from top to bottom, wiping the base off with a towel after I'm done. It takes very little time and make the biggest difference in the way the room looks with the least effort. · Here is a green way to unclog the bathtub drain. First, cover the overflow with a small face towel. Then pour a steaming hot pot of water down the drain. Be sure to boil your water, the faucet water from the bathtub will not be hot enough. Alternate by pumping down the water. Do it at least 4 times. This will keep your pipes flowing smoothly. · I clean stuck-on grease and sticky messes in the kitchen with boiling water. It works so much better than any degreaser and is completely organic and chemical free! · I recently bought a hand steamer for cleaning. It cost under $30. All you do is put plain tap water in it, plug it in and you are ready to go! It "steams" away grease & grime from stove tops, ovens, microwaves, trash can lids and more! After you steam it, you wipe it clean with a cloth and no more mess. No scrubbing. · I keep a closed container of baking soda and a sponge on the ledge of the bathtub. When I take ashower, I put some baking soda on the sponge and clean one wall. That way the wall is cleaned and I'm not dealing with chemicals on my hands or body! Since the walls are already wet you don't have to wet them down and worry about getting wet when you're already dry! · Use baking soda instead of bleach to clean the tub, toilet & sink. There are no harsh fumes and it's easy on the hands. · Baking soda whitens the porcelain sinks and cleans the grease off the stove. You can use it in your laundry, use it to soften your feet before giving yourself a pedicure. So many uses, I buy the big bags of it and use it almost daily. · I use baking soda for a lot of things, but my two favorite uses are both in the kitchen. When I spill drops of grease or get grease splatters on my stove or counter I sprinkle a little baking soda on it, let it sit for a minute or two and then brush it into my hand to throw away without the grease smearing and making a bigger mess. Also, for the kitchen sink. I have a white sink and every time we have a tomato based anything for dinner it turns my sink orange. Sprinkling baking soda in it and then wiping it out is the only thing I've found to work on getting the stains out of my goofy white sink. · I sprinkle baking soda in my stainless steel sink and clean it with a damp sponge. Then I rinse and dry the sink. The sponge goes in the dishwasher to be sanitized, and the baking soda I washed down the sink keeps away odors from the disposal. · Baking soda is used in almost every room of our house. So I keep my baking soda in a recycled grated cheese container so that I can measure it out for baking or shake it all over my shower whenever I need it. This is also more cost effective because I can buy it in the bulk box and just fill my container when empty. · To clean stainless steel items without damage I make a paste of baking soda and water. Rub it on and it will take off grease and just about anything else with a little rubbing and no damage to your stainless! · I use baking soda and vinegar to wash the tiles in my shower. It gets rid of the hard water stain and soap scum instantly after scrubbing. · I use a combination of vinegar and baking soda to unclog my tub drain. Put 1/2 cup of baking soda down the drain first, then 1/2 cup of vinegar and then cover the drain with a small glass dish and let it sit over night! In the morning, run hot water down the drain and the clog is broken up and gone! Works like a charm! · For ring around the tub I sprinkle baking soda on a rag/sponge and spray tub with vinegar. Don't need to scrub much at all. · I use a cup of baking soda and a cup of white vinegar to clean out my garbage disposal. · In order to deodorize my garbage disposal, I pour 1/4 to 1/2 cup of baking soda down and then follow with 1/2 cup of vinegar. I let is sit and bubble for a few minutes and then turn on the water and run the disposal. It really works! !